Providing you the best range of circular vibrating screen, linear motion vibrating screen and dewatering vibrating screen with effective & timely delivery. Screen Dia. 762 mm. 1200 mm. Capacity / Hour * 30 to 200 Kgs. 200 to 400 Kgs. Charging height 1250 mm. 1340 mm. Discharging height 790 mm. 850 mm. Net weight (Approx.) 200 Kgs. 350 Kgs. Gross weight (Approx.) 260 Kgs. 420 Kgs. Circular Vibratory Screen are used to separate mass composition of solids from solids,liquid from solid and for gradation of materials as per particle size, having a very wide range applications. This is accomplished by vibrating the screens in three different planes along the vertical axis by means of a specially designed vibratory motor having off centred weights at the top and bottom end of the motor shaft. The unit consist of Specially designed vibratory motor to run on 400 / 440V, suitable HP, 3 phase, 50 cycles electric supply ,with adjustable eccentric weights at the top and bottom of the motor shafts mounted vertically at the centre of the base plate of screening unit. Screening unit consists of SS 304 screen sandwiched between SS 304 hopper and bowl with the help of special clamp with gasket. Rugged Springs placed over the circular motor base amplify the vibration and at the same time restrict the vibration from being transferred to the floor. Vibrating Screen is designed for consistent performance in heavy-duty applications. They are well-suited for high-tonnage operations such as coal and minerals processing, or large-scale aggregates production. They can screen dry material or, with the addition of water spray pipes, handle wet or dry material and thoroughly rinse it while screening. Vibrating Screen is characteristic of the advanced structure, maximum strength frame, heavy eccentric shaft enhances the screen stroke. It is easily installed on the portable plant or firm foundation with easy maintenance. Vibrating Screen is available in single, double, or, triple decks, They can use polygamy bar screen cloth, steel-plate screen cloth, steel-wire weave screen cloth, rubber pate cloth, and polyurethane screen cloth. The Slope of the screen can be chosen between 15°-25°, the standard slope of the screen is 20degree. 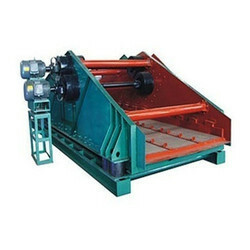 A multi-frequency Dewatering Vibrating Screen has large capacity and it can be full dehydration. The efficient multi-frequency dewatering screen adopts screen side opening holes, and the water flows out from the hole quickly accelerating the dewatering speed, in addition, it avoids the damage due to water splashed onto the motor. The high efficiency multi frequency dewatering vibrating screen can be widely used in tailings dry stacking, fine mineral dewatering, chip removing, carbon-in-pulp separation etc. 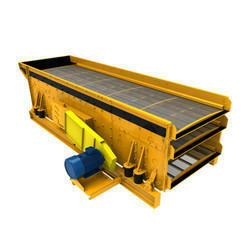 The efficient multi-frequency dewatering screen is particularly suitable for processing fine minerals. In addition, it combines with cyclone, which makes it more efficient and it can be widely used for tailings dry stacking, concentrate dewatering and so on.